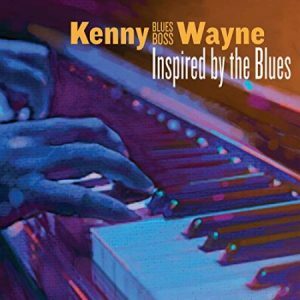 Kenny “Blues Boss” Wayne reaches back into the past to deliver a totally enjoyable collection of piano blues with this release, his fourth album on the Stony Plain imprint. Carrying on a tradition initiated by Cow Cow Davenport, Albert Ammons, Pete Johnson, Meade Lux Lewis and Memphis Slim, he’s a boogie-woogie keyboard player of the first order who usually dons a throwback zoot suit when performing. His primary influences are Fats Domino, Ray Charles and Johnnie Johnson. His smooth, steady, slightly-behind-the-beat delivery swings like a pendulum as it pushes the music steadily forward, breathing new life into a two-fisted technique that originated before the blues migrated from the cotton fields. But don’t be fooled into thinking that this is a retro album full of familiar covers played in a manner that mimics the past. Inspired By The Blues truly is inspired with Wayne fashioning 11 originals in a thoroughly contemporary package that could serve as a lesson in the less-is-more approach that’s all but forgotten today in a world of shredders. A multiple Juno and Living Blues award winner who was born in Los Angeles, but has lived in Kelowna, B.C., 250 miles east of Vancouver, Canada, for years, Kenny handles piano, organ and vocal duties here. Two extraordinary talents — Chicago harmonica master Billy Branch and Rhode Island-based guitarist Duke Robillard make guest appearances. 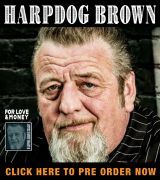 Produced by the Blues Boss and recorded at Dan/Lyn Studio in Edmonton, Alberta, the lineup also includes Joey DiMarco on drums, longtime B.B. King bandmate Russell Jackson on bass and Yuji Ihara on lead and rhythm guitar. Dave Babcock (saxes) and Bob Tildesley (trumpet) provide the horn section, and Lynne Chwyl adds backing vocals. The autobiographical ballad “I Knew I’d Be Playing The Blues” opens the action with Branch’s lilting harp lines accenting, answering Wayne’s vocals and delivering stellar solos, taking Kenny from the church to a day job and raising a family, but always leading him to what he does so well now. The music heats up immediately for “Start Rockin’,” the first boogie in the set. The horns provide propulsive accompaniment as the Blues Boss sings that he can’t wait for sunset because his time to shine is rapidly approaching. The smooth and jazzy “I Like That Woman” delivers a detailed description of the gal with the Blues Boss on organ and with Robillard delivering into a single-note solo during the break. A pleasing jump-time number with a surprise ending, “Jimmy And Johnny,” follows, describing best friends who have a complicated falling out after one comes home with the other’s lady. A straight-ahead 12-bar blues, “Make Up Your Mind,” urges a woman to decide whether her man should stay or go before Wayne delivers “Lake Country Boogie,” a swinging instrumental honoring his homeland in British Columbia that gives the horns plenty space to shine. Next up, “Mr. Blueberry Hill” pays tribute to Domino. Written by Kenny, it comes across with a genuine Fats feel. Two more originals — “An Old Brick Wall” and “That Raggedy Shack” – follow before a slow-and-steady, traditional cover of “Georgia On My Mind,” penned by Hoagy Carmichael and a monster hit for Ray Charles — serves as a bonus track closer. 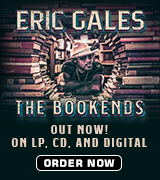 Available through most major online retailers, Inspired By The Blues is a winner on all counts. If you’re either a traditionalist or drawn to contemporary sounds, you’ll absolutely love this one.